Muslim Aid Sri Lanka and its global partner the United Methodist Committee On Relief were two of the co-hosts of a conference on “Moving Beyond Conflict: Spirituality as a Resource for Reconciliation and Reconstruction” held on December 16 and 17 in Colombo. 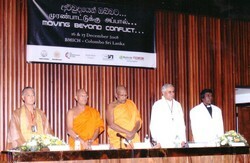 The conference brought together international and national religious leaders and civil society members who exchanged ideas on how best to create a lasting peace in Sri Lanka, which has been torn apart by civil strike for decades. Former Governor of the Indian state of Mizoram, Dr. A.R. Kohli, highlighted the significant role of religious leaders in the conflict resolution process, saying that they were the most influential people of the social structure. Bishop Z. Kameeta of Namibia spoke of the indomitable spirit of a people and how it was the only thing that could withstand any form of brutality, oppression and grievance. Head of the Methodist Church of Sri Lanka, Reverend Ebenezer Joseph, reiterated that finding a lasting solution to the current strife was paramount and said it was vital that people learnt to co-exist so they would be able to live side by side once the war was over. Muslim Aid Sri Lanka Country Director Amjad Saleem said spirituality was the need of the hour, especially since all other avenues had failed. “We take the position that something new has to happen and this conference is the first step towards spiritual reconciliation in Sri Lanka,” he said. The conference participants heard how conflict was resolved in India, Bosnia, Namibia and the UK with the help of religious leaders and civil society. 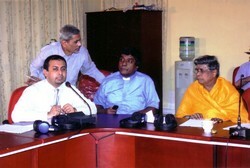 Three case studies of interfaith initiatives for peace and reconciliation in Sri Lanka were also highlighted. 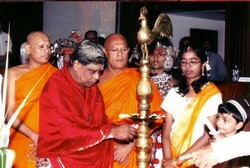 After the main Colombo event, foreign delegates travelled to different parts of Sri Lanka to recount their experiences to regional conferences.